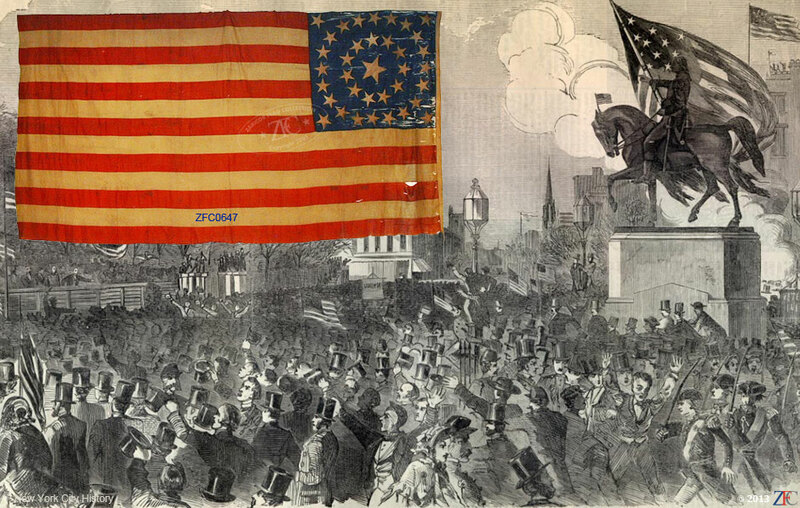 As important as the war itself was the tangled problem of how to reconstruct the nation, as the United States struggled to rebuild, reunite and reconstruct itself after the American Civil War, the national flag bore 36 stars. The state of Nevada entered the Union as the 36th state on October 31, 1864, the flag became official on 4 July 1865 at the very beginning of the Reconstruction Era. Presented in this grouping are 36 star flags from that period, including a large double ring 36 star flag from the collection of John Spargo - Director - Curator of the Bennington Historical Society Museum in Vermont, a flag that later became part of the acclaimed Mastai Flag Collection. 36 star parade flags were used extensively in the North at the various victory celebrations and parades welcoming home discharged soldiers, included here are three examples. Among the other 36 star flags in this grouping is a small U.S. Army Flank Marker flag thought to have been carried in the Grand Review of the Armies on May 23 - 24 1865, as well as a War's End Military Contract flag. Also included in this grouping is a 36 star flag that was later repurposed to decorate the Brooklyn Bridge at it's opening on May 24, 1883. Closing the Grouping is a 37 star flag representing the 1867 statehood for Nebraska and a Union Army discharge, symbolic of the demobilization which occurred during the Reconstruction Era.